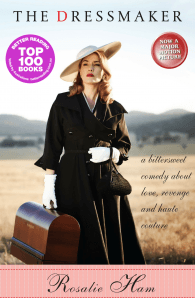 Sometime in the 1950s, Tilly Dunnage, a Paris couturier, returns to her home town of Dungatar having been expelled as a ten year old. Her intention is to visit her mad mother Molly then leave. Instead, she stays, colliding with her past and exacting revenge upon the people who pilloried her. When she does depart, she leaves behind a town ruined, and another past to flee. Kate Winslet, Judy Davis, Liam Hemsworth and Hugo Weaving will star in the screen adaptation, expected in cinemas in 2015. Rosalie Ham is the author of The Dressmaker,Summer at Mount Hope and There Should be More Dancing. Her novels are described as having fresh, unusual and entertaining ideas and have sold over 75,000 copies. Rosalie was born and raised in Jerilderie, NSW and now lives in Melbourne. She holds a Master of Arts in Creative Writing and teaches literature.